The history of uranium mining on Navajo (Diné) land is forever intertwined with the history of the military industrial complex. In 2002, the American Journal of Public Health ran an article entitled, “The History of Uranium Mining and the Navajo People.” Head investigators for the piece, Brugge and Gobel, framed the issue as a “tradeoff between national security and the environmental health of workers and communities.” The national history of mining for uranium ore originated in the late 1940’s when the United States decided that it was time to cut away its dependence on imported uranium. Over the next 40 years, some 4 million tons of uranium ore would be extracted from the Navajo’s territory, most of it fueling the Cold War nuclear arms race. Situated by colonialist policies on the very margins of U.S. society, the Navajo didn’t have much choice but to seek work in the mines that started to appear following the discovery of uranium deposits on their territory. Over the years, more than 1300 uranium mines were established. When the Cold War came to an end, the mines were abandoned; but the Navajo’s struggle had just begun. Back then, few Navajo spoke enough English to be informed about the inherent dangers of uranium exposure. The book Memories Come to Us in the Rain and the Wind: Oral Histories and Photographs of Navajo Uranium Miners and Their Families explains how the Navajo had no word for “radiation” and were cut off from more general public knowledge through language and educational barriers, and geography. The Navajo began receiving federal health care during their confinement at Bosque Redondo in 1863. The Treaty of 1868 between the Navajos and the U.S. government was made in the good faith that the government – more specifically, the Bureau of Indian Affairs (BIA) – would take some responsibility in protecting the health of the Navajo nation. Instead, as noted in “White Man’s Medicine: The Navajo and Government Doctors, 1863-1955,” those pioneering the spirit of western medicine spent more time displacing traditional Navajo healers and knowledge banks, and much less time protecting Navajo public health. This obtuse, and ultimately short-sighted, attitude of disrespect towards Navajo healers began to shift in the late 1930’s; yet significant damage had already been done. Founding director of the environmental cancer section of the National Cancer Institute (NCI), Wilhelm C. Hueper, published a report in 1942 that tied radon gas exposure to higher incidence rates of lung cancer. He was careful to eliminate other occupational variables (like exposure to other toxins on the job) and potentially confounding, non-occupational variables (like smoking). After the Atomic Energy Commission (AEC) was made aware of his findings, Hueper was prohibited from speaking in public about his research; and he was reportedly even barred from traveling west of the Mississippi – lest he leak any information to at-risk populations like the Navajo. In 1950, the U.S. Public Health Service (USPHS) began to study the relationship between the toxins from uranium mining and lung cancer; however, they failed to properly disseminate their findings to the Navajo population. They also failed to properly acquire informed consent from the Navajos involved in the studies, which would have required informing them of previously identified and/or suspected health risks associated with working in or living near the mines. In 1955, the federal responsibility and role in Navajo healthcare was transferred from the BIA to the USPHS. In the 1960’s, as the incidence rates of lung cancer began to climb, Navajos began to organize. A group of Navajo widows gathered together to discuss the deaths of their miner husbands; this grew into a movement steeped in science and politics that eventually brought about the Radiation Exposure Compensation Act (RECA) in 1999. Cut to the present day. 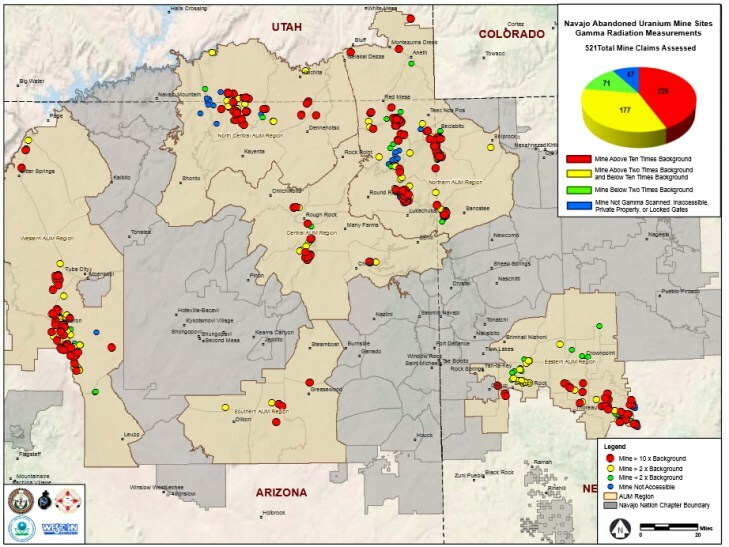 According to the US EPA, more than 500 of the existing 1300 abandoned uranium mines (AUM) on Navajo lands exhibit elevated levels of radiation. The Los Angeles Times gave us a sense of the risk in 1986. Thomas Payne, an environmental health officer from Indian Health Services, accompanied by a National Park Service ranger, took water samples from 48 sites in Navajo territory. The group of samples showed uranium levels in wells as high as 139 picocuries per liter. Levels In abandoned pits were far more dangerous, sometimes exceeding 4,000 picocuries. The EPA limit for safe drinking water is 20 picocuries per liter. This unresolved plague of radiation is compounded by pollution from coal mines and a coal-fired power plant that manifests at an even more systemic level; the entire Navajo water supply is currently tainted with industry toxins. While many environmental movements are fighting to establish proper regulation of pollutants at state, federal, and even international levels, these four cases are representative of a pervasive, environmental racism that stacks up against communities like the Navajo and prevents them from receiving equal protection under existing regulations and policies. Despite the common thread among these cases, the wave of righteous indignation over the ongoing tragedy in Flint has yet to reach the Navajo Nation, the Mohawk community of Akwesasne, the Yakama Nation – or the many other Indigenous communities across the United States that continue to endure various toxic legacies in relative silence. Current public outcry may be a harbinger, however, of an environmental justice movement ready to galvanize itself towards a higher calling, one that includes all peoples across the United States, and truly shares the ongoing, collective environmental victories with all communities of color.